Steel, the Penguins, the Hill District and the Civic Arena. So much Pittsburgh history all imploded together into a spatial singularity, it collectively is a bit sublime; and even more impactful on what it means for the neighborhood. 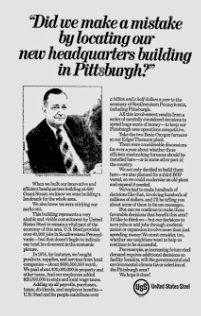 Keeping US Steel's headquarters in Pittsburgh has now, quite remarkably, become subsumed into all facets of the debate on Hill District re-redevelopment. What I don't think has ever been written has been the omni-decade overview of how many redevelopment efforts there have been in the Hill District. Many we know about, but many kind of get forgotten quickly. Some efforts go way back (see photo below), but even much more recent efforts have been banished from memory.. I really don't think there has been one great effort to look comprehensively across the decades to explain how the Hill District has changed. But the location of US Steel's headquarters obviously still has an emotional tug for the 'Steel City.' It is often overlooked that US Steel's headquarters through its first half decade of existence was actually in New York City befitting the corporation's genesis in the capital accumulation of JP Morgan. Only in the 1950s did Pittsburgh formally become the headquarters for the corporation. Then, when US Steel morphed into USX in the 1980s, the headquarters of the holding company for a time was in Texas, only to return to Pittsburgh officially after Marathon Oil was divested. That history is forgotten probably because the megalithic "Steel Building" seems to be a permanent presence defining Pittsburgh, or at least Downtown. But in reality 600 Grant Street is a relatively modern building. The building itself only opened in the 1970s and before that the headquarters was located adjacent to Mellon Park. Politics has long had a role in the location of the corporations HQ. When air pollution battles were escalating in the 1970s, there was this full page ad blasted into the media. Begs a question of what would have happened if pollution control efforts had been derailed? I forgot about this graphic from few years ago which is incredibly apropos to the topic This advertisement (circa 1961) presages just how intertwined the history of U.S. Steel and the Civic Arena have always been. U.S. Steel asks us to "Look what the earthlings built!" but read the subtext as well. I needed the hint. Thanks. (3) US Steel is receiving large public subsidies for this project. There is indeed a lot symbolism in all this. Just not the kind the politicians standing on the podium are likely to emphasize.